As a dedicated realtor, you face a challenging task – you have to figure out how to generate real estate leads and keep them engaged all the way through their home search process until they are finally ready to close. Now that Trulia, Zillow, and the other real estate directory websites have snagged the all-important top spots in search results for most real estate-related terms, competition for internet leads has become incredibly fierce. Simply putting up an attractive real estate website and waiting for home buyers to come to you isn’t going to work; in order to generate more internet leads, real estate professionals need to take a proactive approach with their online marketing strategies. Once you generate real estate leads, they need to be actively nurtured for an extended period of time. The National Association of Realtors’ 2015 Profile of Home Buyers and Sellers found that typical home buyers search online for 10 weeks before purchasing a home, but many realtors have sold homes to leads that they had nurtured online for an entire year or more. Fortunately, there are several ways that realtors can use content marketing to nurture internet leads and keep them engaged for as long as it takes to make the sale. To help you on your way, we’ve got some real estate lead generation strategies that will help you generate and keep your internet real estate leads engaged during every step of their home search journey. At For Sale Marketing, we’ve searched through the results of the leading real estate studies, and combined it with our years of real estate marketing experience to figure out the best way to generate real estate leads online. We’ve distilled the information into pro-active lead generation strategies that will help you sign more real estate clients. The majority of new home buyers (89 percent!) use their tablet and/or smartphone throughout the home search process. If your website doesn’t deliver perfect performance on all types of mobile devices, property buyers are going to go to your competitors’ real estate sites to find their next home. Our responsive real estate website designs deliver flawless performance no matter how they are accessed, so prospective home buyers can switch between devices while enjoying a consistently enjoyable browsing experience. To make sure you get all the information you need to turn website visitors into active leads, For Sale Marketing has developed a set of real estate lead generating forms for your website. 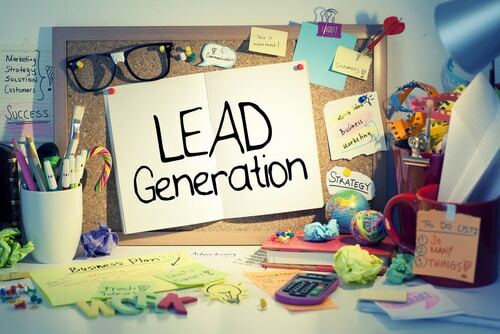 Drawing on years of experience, as well as the latest marketing research, we have dynamic lead generating forms that are precisely tailored to be the right length to get the best results – long enough to get the details you need, short enough that prospective leads don’t get frustrated and stop partway through filling out the forms. Adding a blog to your real estate website is a great way to bypass the search engine blockade that the directory sites have created and direct traffic to your site. Once your site is up and running, you can publish a robust smattering of informative content, such as How-to guides, helpful tips, neighborhood walk-throughs and other local information on your blog. This will do a good job of introducing home buyers to what you have to offer. No blog writing skills or inclination? Don’t worry, For Sale Marketing has some expert Real Estate SEO copywriters who can author your blogs for you. Now that the large directory sites have snagged the top spots in general real estate search results, local and hyper-local search terms have emerged as the best way to reach home buyers. In fact, a whopping 69% of home shoppers who take action on a real estate brand website begin their search using a local term. For Sale Marketing can perform local keyword analysis to find the local and hyper-local search terms that home buyers are using and the large directory sites have overlooked. We’ll insert them appropriately throughout your website, and incorporate them into your web copy and blog. To generate even more real estate leads, we can create community pages and sections on your website and then optimize them for local search using keywords related to specific neighborhood features and terms that home buyers are interested in. Personal referrals are still the number one way that most home buyers and sellers find their real estate agent, so you need an active yet non-obtrusive way to stay top-of-mind with all the clients you’ve helped over the years. A monthly email newsletter is an ideal way to do that, and it’s not hard to put together. Combine a helpful “How to” guide with tips for home buying, selling, moving etc., with a reprint of one of your blogs about a local neighborhood, and finish with one or two beautiful pictures with your favorite listing of the month, and you’re good to go. To generate even more real estate leads, segment your email subscriber list according to demographics, home type, etc. and send out different versions of your newsletter specifically targeting each group’s interests. For more information on our real estate lead generation strategies, along with comprehensive support services for all your real estate internet marketing strategies, call us at For Sale Marketing today. We can provide you with everything you need to generate more internet leads, including a responsive real estate web design that includes fully-integrated IDX, lead generating real estate forms, expert SEO services, social media marketing, and more.